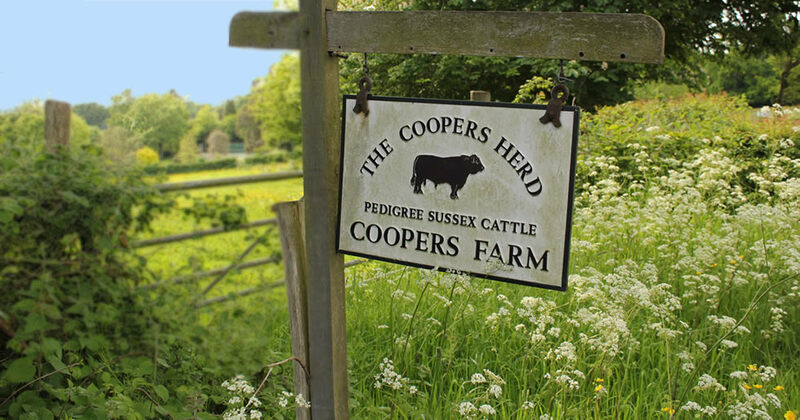 Coopers Farm is a family-run livestock farm in the middle of the Sussex High Weald, an area of Outstanding Natural Beauty. Little has changed over the years. The 100 acres are still farmed in a very traditional manner with cattle, sheep, pigs, chickens and bees. We have wonderful wild flowers, wildlife and plenty of birds to watch and enjoy. At night the skies are pitch black – look up and enjoy the stars – and the only thing likely to keep you awake at night is the owls hooting or if you come in May the nightingales singing. Thank you for making me so welcome. The quiet was heavenly and the cottage so comfy and cosy. Lovely walks and animals. We stayed at this lovely farm with our dogs. Beautiful location and off the beaten track, perfect for a relaxing retreat. The converted barn was full of oldie worldie charm but with all mod cons including a very good wifi connection and dishwasher etc. Lovely comfy beds with a skylight so you can see the stars at night.